Michelle Miller received her BFA from Ohio University in 2003. She has completed residencies at the Cub Creek Foundation for the Ceramic Arts, Virginia and Cite Internationale des Arts, Paris. She currently lives in Philadelphia where she serves as the Ceramic Technician at the University of Pennsylvania and works in her recently renovated warehouse studio. Michelle is known for her fun and decorative functional wares. 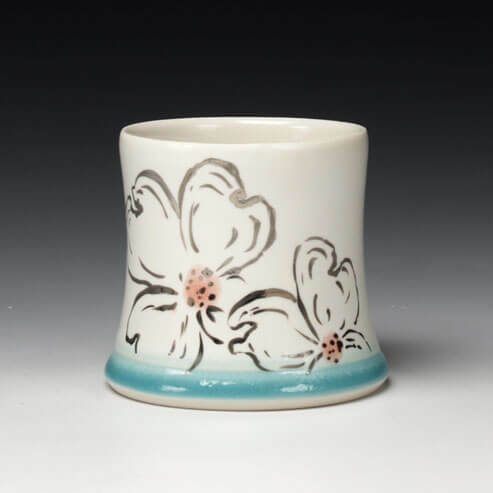 Combining traditional wheel-thrown forms with hand painted luster designs, she creates works with a contemporary approach to floral decoration in the ceramic community. The forms and surfaces of my work evolve in response to my experiences, to a life in progress that demands both utilitarian and aesthetic value. My most recent work, The Flora Series, tracks the states I’ve lived in, represented by the state flower. This body of work serves as a reminder that the essential comfort and nourishment of home are important even for a life in transit.